Seabourn will visit Antarctica for the first time in 2013. Seabourn Quest, the newest ship in Seabourn’s award-winning fleet, will begin a series of four 21- to 24-day voyages sailing between Valparaíso, Chile and Buenos Aires, Argentina starting in November of 2013. 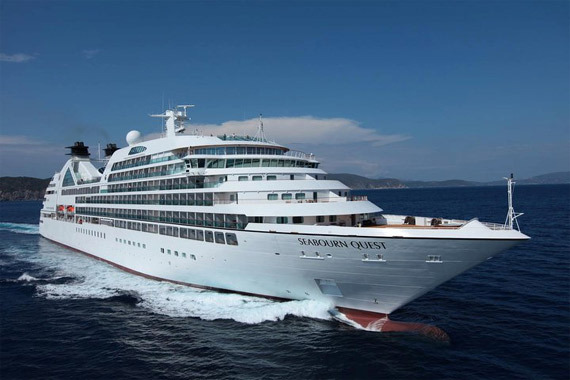 Seabourn Quest will be specially retro-fitted and protected and will be classified as an Ice-rated ship, offering discerning travellers the opportunity to combine a luxury cruise with an adventure, and go ashore for more in-depth discoveries! Cruising the Chilean coast, Seabourn Quest will visit Puerto Montt for the Chilean Lakes District, Castro on the huge island of Chiloé, and Puerto Chacabuco, from where guests can tour the magnificent Torres del Paine National Park. The ship will thread the glaciers, peaks and channels of the Chilean Fjords, culminating in a transit of the Beagle Channel and its spectacular Glacier Alley . Weather permitting, following a call at Ushuaia in Argentina’s Tierra del Fuego, Seabourn Quest will cruise by Cape Horn bound for the Southern Ocean. Guests on board Seabourn Quest will experience five days in Antarctica, including scenic cruising of highlights such as the breathtaking Lemaire Channel, picturesque Paradise Bay and the Gerlache Strait. On board Seabourn Quest, an experienced Antarctic expedition staff will ensure that guests enjoy the best of the numerous available sites for landings and cruising in smaller inflatable boats, based on real-time weather and wildlife reports during their Antarctic adventures. Scientists, naturalists and other lecturers in a number of disciplines will speak on board and accompany guests ashore to add insights to their once-in-a-lifetime experiences. 11 Dec 13: 24-night Santiago to Buenos Aires (featuring Patagonia, Antarctica & South Georgia Island plus Christmas & New Year at sea! The 24-day Christmas/new cruise will include two days exploring the sub-Antarctic wildlife Eden of South Georgia Island, renowned for its beauty and its vast, teeming rookeries of king penguins and other seabirds, as well as breeding elephant and fur seals. The launch of these new ‘Ultimate Antarctica & Patagonia’ sailings means that Seabourn now sails to all seven continents. Bookings open for sale on 4 September 2012. For more information or to take an option, please contact Deluxe Cruises as soon as possible and these voyages will be very popular.